The iron suspension bridge between Marlow in Buckinghamshire and Bisham in Berkshire is the third bridge at this spot and replaced a timber structure. It is the only suspension bridge over the non-tidal length of the River Thames, and has been substantially restored. 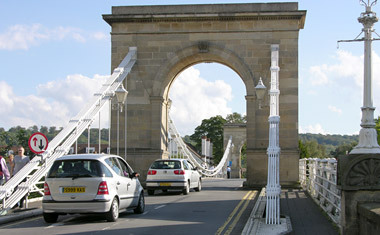 Most traffic now uses the nearby modern road bridge, the Grade I listed Marlow Bridge carries light vehicles and pedestrians. The first bridge was said to exist in 1227. It was of timber construction and located about 100m downstream (east) of the present bridge. In 1309, Gilbert de Clare (1291-1314, 8th Earl of Gloucester and 7th Earl of Hertford) was granted letters patent for four years' pontage (charges for vessels passing under the bridge) to repair "your bridge which is decayed and broken". In 1353, a toll of 3d (1.25p) was imposed and, in 1399, repairs carried out. Little is known of the bridge’s history until 1642, when it was damaged by Major General Brown of the Parliamentary forces during the English Civil War (1642-1651). Repairs were paid for through county rates. By 1786, it had become unsafe and was a cause for concern. In 1788, the Marquess of Buckingham initiated a public subscription to pay for a new timber bridge at the site. It opened in 1789, though apparently the height of the navigable arch had to be raised 457mm to enable the passage of barges. By 1828, it was reported that the second bridge had "fallen into a state of decay, so as to make the passage of it in a degree dangerous to the public". The meagre revenues from local lands were insufficient for its maintenance and a court case decided the crown should "provide and keep up a safe and proper bridge over the Thames at Marlow". A stone bridge of five elliptical arches was proposed, "If the expense is not too great" to give the town not only a "grand entrance … on the Buckinghamshire side, but a great improvement in the road on the Berkshire side". On 28th October 1828, the newly formed bridge committee reviewed four types of construction — in timber, of stone, a cast iron arch or a suspension bridge. Possibly to demonstrate its position in the forefront of technical knowledge, the committee chose the more expensive option of an iron suspension bridge, with an estimated cost of £8,803, designed by John Millington (1779-1868). On 14th May 1829, the Marlow Bridge Act was passed, authorising fund raising through rates or private loans in addition to the sale of revenue lands. Financial liability was apportioned 80 percent to Buckinghamshire and 20 percent to Berkshire, reflecting the position of the county boundary along the Thames at the site of the two timber bridges. Selling the revenue lands raised £3,000 and the materials from the old bridge £92.60. The committee accepted three separate tenders for the project. The masonry piers were tendered by Clifford & Corby of Marlow at £5,058.96, the timber deck by William Bond of Marlow at £795.80 for oak, or £770.02 for old ships' timbers, and the ironwork by William Hazledine (1763-1840) of Shrewsbury at £3,650. The total of £9,504.76 (£9,478.98 with used timber) was about 8 percent higher than Millington’s estimate. The bridge design consisted of a deck 9.1m wide suspended from two pairs of towers 66.75m apart by four pairs of suspension chains on each side. The 6.7m high tapering towers were of 51mm thick cast iron plate with 3m square bases, set on stone pedestals. The chain links were to be wrought iron rods 3m long and 51mm in diameter. Millington’s construction specifications and his supervision of the works during the summer of 1829 were criticised. He laid the first stone on 22nd September but later relinquished his position. On 24th October 1829, he sailed to Mexico to work with the Anglo-Mexican Mining Association of Vera Cruz for three years, after which he moved to America. William Tierney Clark (1783-1852) was appointed to complete the bridge, and his redesign involved making alterations to the chains and piers. Clark had excellent credentials. He had worked alongside John Rennie (1761-1821), and he designed the first suspension bridge over the Thames, Hammersmith Suspension Bridge (opened 1827, replaced by the present bridge 1887). The smaller bridge at Marlow shares similarities with Hammersmith, notably in the use of masonry arches for the suspension towers. The main span of Clark’s Marlow Bridge measures 69.3m between pier centres, with flanking spans of 21.6m to the north and 21.4m to the south. The pier bases are of rusticated masonry and brickwork, with Doric arches above deck level. The original carriageway was about 6.1m wide with footways on either side around 1.5m wide. The suspension system consists of two wrought iron chains four links wide, running one above the other, on both sides of the bridge. Each pair of chains passes through openings in the tops of the arches and over an array of roller bearings, with their turning points formed in curved links. Reputedly, Hazledine and Clark were in disagreement about the ironwork dimensions and though Hazledine prevailed, project completion was delayed by almost two years. Hazledine’s intervention, presumably increasing the size of the iron members, led to the structure’s longevity. The final cost was £22,000 including the approaches, and the bridge opened on 23rd September 1832. In 1833, the earlier timber bridge was demolished. Clark went on to design the Széchenyi Chain Bridge (opened 1849), across the River Danube in Budapest, Hungary. In 1860, the oak cross beams of the Marlow Bridge deck were replaced by wrought iron girders. The work was carried out by Easton, Amos & Sons of The Grove, Southwark, London. In 1908, Marlow Urban District Council requested the strengthening the bridge to carry 12.2 tonnes to withstand the weight of increasing traffic volumes. Some redecking was carried out in 1910, but by 1924 a gross weight restriction of 5.1 tonnes had to be imposed. Concerns over the strength of the bridge prompted the Buckinghamshire and Berkshire authorities to discuss replacing the suspension structure with a single arch of reinforced concrete, similar to that at Reading Bridge (opened 1923). However, the proposal was not taken forward. In July 1949, Marlow Bridge was Grade I listed. Over time the suspension chain ironwork in its anchorages corroded and several suspender rods fractured. In 1958, the weight limit was reduced from 5.1 tonnes to 2 tonnes. The poor condition of the anchorages led to further plans for bridge replacement, though local opinion was heavily in favour of retaining the existing structure. On 17th August 1962, it was decided to reconstruct the bridge to its original appearance, with the capability of bearing a 15.2 tonne vehicle. The weight requirement was later revised to 5.1 tonnes. The substantial restoration project was carried out in 1965-6, by consultant Rendel, Palmer & Tritton, main contractors Horseley Bridge and Thomas Piggott Ltd, and sub-contractor Aubrey Watson Ltd. Steel suspension chains and a steel deck were installed simultaneously. The total cost was £223,000. It was found that much of the wrought ironwork was still sound owing to the quality of the workmanship. It was retained where possible and the necessary new steelwork replicates the original design. The palm tree motif on the heads of the handrail upstands are a new feature. To replace the suspension chains, "it was found advantageous to write a program for processing on an electronic computer, the calculation of the lengths of the eye-bar chain links, the geometry of the connector plates carrying the suspenders being somewhat complex". The use of computer modelling was unusual at the time, and undertaken on a mainframe computer. The original roller bearing design was found to be problematic. The bearings did not operate properly as movement of the curved links in use at the chain turning points was limited to small elastic deformations by the roller array. The adjacent straight links in the chains passed over a roller and were subject to large bending stresses even though they were intended as tension members. The dead load of the bridge further increased the bending stresses in the links. New bearings were designed to provide the degree of movement required, enabling the new eye-bar chain links to function correctly. The expansion rollers in the bearings are encased in expanded pitch-polyurethane for protection — probably the first use of this technique. High-tensile steel bars carry the chain tension to the rear of the anchor blocks, pre-tensioned to prevent cracking in the concrete at the front ends of the blocks. The new suspension chains were set more than 75mm higher at the centre of the main span, with a margin for the ambient temperature differing from the design temperature of 20 deg C, to allow for settlement as the chains took up the bridge's dead load. Before the original chains were removed, their axial load was released while they were hanging freely, with the bridge load carried by the new structure. Straining rods were erected midspan to bypass the two middle sets of original chain links on the main span. The rods were jacked to discharge the load in the links, which were then removed, and the jacking strain reduced gradually until the jacks returned to their unloaded positions. The old chains settled onto cradles attached to the new chains and were dismantled in sections, working simultaneously from the centre of the main span and the anchor blocks towards the towers to maintain uniform loading. A temporary timber deck supported on trestles was installed to allow traffic to use the bridge during the works. It was tethered with wire guys fixed to the quarter points of the main spanto resist cross winds. Each guy was anchored to a pair of sheet piles driven into the river bed. Methods were developed for cutting the steel chain links and welding the deck plates in the restricted workspace available below the temporary deck. The lattice girders providing transverse deck stiffening were erected piecemeal and connected with high-strength friction-grip bolts. Welded lattice extensions at the ends of the cross girders form cantilevers to carry footways outside the line of the suspension chains. The girders also carry service ducts. The temporary deck was replaced sequentially by new steel deck plates, and load transferred gradually from the timber trestles to the new suspension chains to ensure uniform loading. The whole steel deck was erected in about a month. The new deck is at a higher level than the original (584mm higher at midspan), keeping the same clearance below the bottom chord of the stiffening girder as existed beneath the underside of the original deck. The new deck is a two lane carriageway, 5.5m wide between kerbs, flanked by 1.2m wide timber footways. It is surfaced with lightweight gritted epoxy resin. In 1972, a balanced cantilever concrete bridge (SU859859) opened some 800m downstream (east) of the suspension bridge. It carries the A404 trunk road. In 2004, Buckinghamshire County Council spent £500,000 reinforcing the Marlow Bridge’s bearings and timber parts. By April 2007, repairs had been undertaken twice more but timber damage and flaking paint were evident. Police spot checks also indicated vehicles exceeding the imposed weight limit of 3 tonnes, though the number so doing was not known. During July and August 2013, Transport for Buckinghamshire carried out maintenance and repair works to the stonework of the towers, chains, hangers and handrails, the deck expansion joints, the anti-skid surfacing to the carriageway and footways, and the road markings. The bridge was closed to vehicular traffic during the works. Similar works were undertaken in August 2016. On 24th September 2016, in the late evening, a 40 tonne lorry using GPS navigation attempted to cross the bridge and got stuck between the traffic calming measures on the north side. The bridge was assessed rigorously by structural engineers and found to be safe. It remains in daily use.